The 2400-passenger Norwegian Gem is the 6th and final ship in Norwegian Cruise Line's (NCL) Jewel class, and the 13th ship in the NCL fleet. It resembles the Norwegian Pearl, which was launched in 2006. Ten of NCL's ships have been built since 1999, giving the cruise line the youngest fleet among the North American cruise lines. 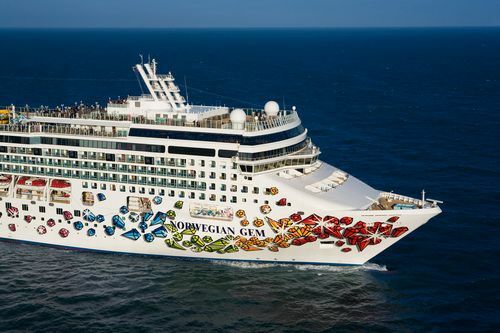 Launched in October 2007, the Norwegian Gem capitalizes on NCL's Freestyle Cruising concept, which was first introduced to the cruising public in May 2000. Freestyle Cruising is primarily characterized as significantly relaxing the structure and formality of traditional cruise ships by having no fixed dining times, no formal dress codes, up to 10 diverse restaurants, numerous bars and lounges, and relaxed disembarkation. In addition to the Freestyle Cruising theme, the Norwegian Gem has some innovative features such as a four-lane bowling alley and some of the most luxurious suites in the industry. The Norwegian Gem also adds some new onboard activities such as a 30-foot high rock climbing wall and a Wii Nintendo system in the Crystal Atrium. Using the giant high-definition projection screen in the Crystal Atrium to play a Wii game adds to the excitement. The Norwegian Gem's fitness center is even open 24 hours a day for those who are jet-lagged or love to work out at odd hours. The Norwegian Gem has ten distinctly different dining options, ranging from the elegant Le Bistro French Restaurant to the entertaining Teppanyaki Room to the 24-hour casual Blue Lagoon diner. The cruise ship has culinary choices from around the world, so there is something for all tastes. Four of the restaurants have additional cover charges from $10 to $20 per person. The two large dining rooms are the Grand Pacific and the Magenta. They serve traditional cruise cuisine and are open for breakfast, lunch, and dinner. For a taste of other cuisines, passengers can visit the Tequila Latin/Tapas for a taste of south of the border, La Cucina for authentic Italian-style dishes, and the Orchid Garden for Asian food, including a Sushi Bar. Cagney's is an upscale American steakhouse, serving an array of steaks, chops, chicken, and seafood. Finally, the Garden Cafe is an "action station" buffet-style restaurant, with much of the food prepared-to-order and an outdoor dining area at The Great Outdoors. The Norwegian Gem also has 24-hour room service and a private concierge lounge for villa, suite, and penthouse guests. Since the Norwegian Gem has open seating, the cruise line has implemented a restaurant reservation system that allows passengers to check the availability of each restaurant. Plasma screens placed in high-traffic areas around the ship and outside each restaurant provide the status of each of the ten restaurants. If a restaurant is full at a specific time, the screens indicate all the available alternative restaurants and an estimated wait time. Passengers can make reservations up to 24 hours in advance, and pagers are provided when they check in for a table. Like most large cruise ships, the Norwegian Gem has numerous bars and lounges scattered throughout the ship. All are filled with cold drinks and lots of fun. Starting at the top of the ship, the Spinnaker Lounge serves as an observation lounge, but also has a nice dance floor, games, and televisions for watching sporting events. Topsiders and Bahi Hai are both located near the pool deck and have outdoor seating, as does The Great Outdoors. One of my favorites is the Star Bar, found just off Cagney's Steakhouse. It's a little quieter and more romantic. Moving down a few decks, you will find Bar Central on deck 6. This entertainment center has four interconnected bars--Maltings Beer and Whiskey Bar, Magnum's Champagne & Wine Bar, Shakers Martini & Cocktail Bar, and the Corona Cigar Club. Nearby on deck 7 is the Java Cafe located in the Crystal Atrium. In addition to bar drinks, it serves specialty coffees and teas. Finally, the most innovative lounge on the ship is the Bliss Ultra-Lounge, aft on deck 7. Bliss has funky decor, with lots of crushed velvet and beds for lounging. Just for fun, Bliss has four bowling alleys and transforms into a busy nightclub when it gets late. Now that we've looked at the dining and drinking establishments, let's move onto the rest of the public areas on the Norwegian Gem. Most of the interior public areas of the Norwegian Gem are modern and contemporary. The Crystal Atrium is particularly impressive. NCL has added a two-deck high definition projection screen, which can show movies and popular sporting events (like bowl games), or be used to play Nintendo Wii games. Even if you don't play the Wii games, it's fun to watch your fellow passengers! The atrium has become a gathering place for passengers to have fun in this large, open environment. The Ying & Yang Spa also has a special look. Mandara operates the spa, and it has a wonderful tranquil ambiance. All of the standard spa treatments are available in the spa, and you can even schedule a massage in your cabin. Next to the spa is the Body Waves Fitness Center, which is open 24 hours a day. This fully-equipped gym includes the latest machines and has floor to ceiling windows, so you can enjoy the sea views while working out. The fitness center also features yoga, aerobics, spinning, Pilates, and a variety of other exercise classes. For gamers, the Norwegian Gem has the Gem Club Casino, with all the latest games and more than 200 slot machines. If you'd rather spend your money in ship shops, the Trade Routes Boutiques offer a little of everything. It's fun to browse or to buy! The Norwegian Gem is well designed for family cruising. The NCL Kid's Crew program is for kids from two to 17, with many complimentary activities. The Kid's Crew program is available year-round on days at sea (9 am - noon, 2-5 pm, and 7-10 pm) and on port days (7-10 pm). A group sitting service is also available (for a fee) each night from 10 pm to 1 am, and during additional hours in port. The Norwegian Gem has specially designed activities for three age groups: Kid's Crew (ages 2-9), Tweens Crew (ages 10-12), and Teens Crew (ages 13-17). Young children have their own space on the Norwegian Gem in the Tree Tops Kid's Club, while the teens will enjoy the Leopard Lounge and the Video Arcade. In addition to the specially planned activities for kids, they will also enjoy the large pool with water slide, rock climbing wall, bowling in the Bliss lounge, and the Nintendo Wii game, which is available in both the Crystal Atrium and in the Kid's Crew facility. Kids on the Norwegian Gem even have their own dining area, with smaller tables and chairs, at the Kid's Cafe. The Norwegian Gem's focus on family cruising extends to its accommodations. The Norwegian Gem has more than 30 different cabin categories in its 1197 total staterooms, of which 542 have balconies. The ship's most luxurious suites are the two Garden Villas, with about 5000 square feet of space and three bedrooms. The Garden Villas overlook the pool deck and have their own whirlpool and steam bath. The two Deluxe Owner's Suites on deck 15 have butler and concierge service, a king-size bed and terrace with hot tub. The best thing about the 10 Courtyard Villas on deck 14 is the access to the private courtyard area. This area has a lap pool, hot tub, steam rooms, a small gym, and lovely sun beds and hammocks. The Courtyard Villas have spacious living and sleeping areas, and eight of the villas have separate bedrooms for kids. Since this courtyard area is shared by only these few top-priced suites, it is a great quiet getaway place. The Norwegian Gem also has about 30 other smaller suites, all of which are roomy and have special amenities. Four of these suites are Romance Suites, with a nice private balcony, a queen-size bed, and a small sitting area. Families will appreciate the numerous interconnecting cabins and suites of all categories. You can create up to a five-bedroom area! In addition to all the suites, the Norwegian Gem has a standard balcony, ocean view, and interior cabins for those watching their budgets. The Norwegian Gem has a beautifully decorated bow and sleek white exterior. The deck areas are nice, with two pools, deck chairs, and hot tubs. The small children have their own kid's pool. We sailed on the Norwegian Gem on a short preview cruise out of Boston on a wintry December day. As you can see in this photo, the pool deck looks a whole lot different than you would expect on a "regular" cruise! In summary, the Norwegian Gem is a terrific new addition to the NCL fleet and to the cruise industry. Those who love "Freestyle Cruising" should certainly try this ship!